A system of particles is said to be in a bound state if the relative motion of the particles occurs in a bounded region of space (is finite) over a period that is long compared with the periods characteristic of the given system. Nature offers many examples of bound states—from star clusters and macroscopic bodies to such very small entities as atoms, molecules, and atomic nuclei. Many of the particles often referred to as elementary may actually be bound states of other particles. To form a bound state, attractive forces must exist between at least some particles of the system at certain distances between the particles. For stable bound states, the mass of the system is less than the sum of the masses of the constituent particles. The difference Am determines the binding energy of the system: Ebinding = Δmc2, where c is the speed of light in a vacuum. Bound states are described in classical mechanics by finite solutions of the equations of motion of the system, where the trajectories of all particles in the system are concentrated in a bounded region of space. An example is Kepler’s problem of the motion of a particle or planet in a gravitational field. In classical mechanics a system of two attracting particles can always form a bound state. If the region of distances at which particles are attracted is separated by a potential barrier from the region in which the particles repulse each other (see Figure 1), then the particles can also form stable bound states if their motion obeys the laws of classical mechanics. Figure 1. An example of the dependence of the potential energy U on the distance r between particles. This example illustrates the existence of regions of stable and quasi-stable bound states. Stable bound states lie in the region of energies E < O; the energies here are less than the value of U as r. To these states there correspond discrete energy levels. When E > O, stable bound states do not exist. In, however, the region O < E < Ub where Ub is the height of the potential barrier, quasi-stable bound states can exist at certain values of E. The lifetime of such a state is determined by the probability of tunneling through the potential barrier and can be very great, especially for particles of large mass. In the case of macroscopic bodies, whose motion is described by the laws of classical mechanics, stable bound states can have any energy in the region Uo < E < Ub. energy of attraction and the range of the forces be sufficiently great (seePOTENTIAL WELL and ZERO-POINT ENERGY). Moreover, in a potential well of the type illustrated in Figure 1, particles can escape from the region of attraction through the tunnel effect. Thus, stable bound states are not formed if the energy of a particle is greater than the potential at infinity. If, however, the probability of tunneling through the barrier is small (at the classical limit it is equal to zero), then a particle can be located in such a potential well for a period that is long compared with the periods of motion in the well. For this reason, in addition to stable bound states there exist unstable bound states, which decay with time; such states are said to be metastable or quasi-stable. The nuclei of some heavy elements, for example, are unstable bound states with respect to alpha decay or fission. In the extremely relativistic case, where the binding energy of the system is comparable to the rest energy of the particles in the system, the solution of the bound-state problem requires the use of quantum field theory. Present-day quantum field theory is not able to provide an exact solution to this problem. Some of the approximate methods being developed permit the consideration of stable and unstable “elementary” particles, including resonance particles, in an identical manner. According to some hypotheses, all hadrons, or all strongly interacting particles, are bound states of more fundamental particles of matter called quarks. This effect will be demonstrated below by comparisons between the results for the bound state energies obtained by the t-matrix averaging and by the potential averaging calculations. the velocity of a two-pulse bound state is always less than that of an individual pulse. In this case, there could be no "additional" bound state. 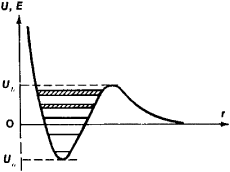 The observed position of the peak is always red shifted with respect to the actual bound state energy [E.
When conducting electrons in silicon drop to a lower-energy, bound state, the excess energy is converted into phonons, or vibrations of the crystal lattice, rather than photons. In the bound state, the IGF-1 is inactive, and remains so until delivered to target tissues in the body where it is released and becomes biologically active. It is well- known that elections are there and it's a poll- bound state," he said. Still in its infancy, the science of neuroengineering is poised to move from perceptual aids, such as cochlear implants, to devices that enhance and speed up thought, to the ultimate goal of some researchers: uploading the mind from its bound state in the body to a platform- independent existence. Gallium arsenide naturally emits lightbecause it has what is known as a direct-energy band gap: When free, conducting electrons drop to a lower-energy, bound state, they transfer their energy directly to light. In the bound state, the IGF-I is inactive, and remains so until delivered to target tissues in the body where it is released and becomes biologically active. Some topics have been omitted and placed on the web site; others, such as the Wigner quasi-probability distribution, time- dependent perturbation theory, and timescales in bound state systems, are new. A few examples of specific topics include the latest experimental results on pentaquarks, an overview of spin physics, deconstructed Higgsless models, approximated Faddeev-Niemi knotted solitons, topological susceptibility in the SU(3) gauge theory, finite temperature lattice gauge theories in external fields, sum rules for leading and subleading form factors in heavy quark effective theory using the non-forward amplitude, and quark-antiquark bound state equation in the Wilson loop approach with minimal surfaces.